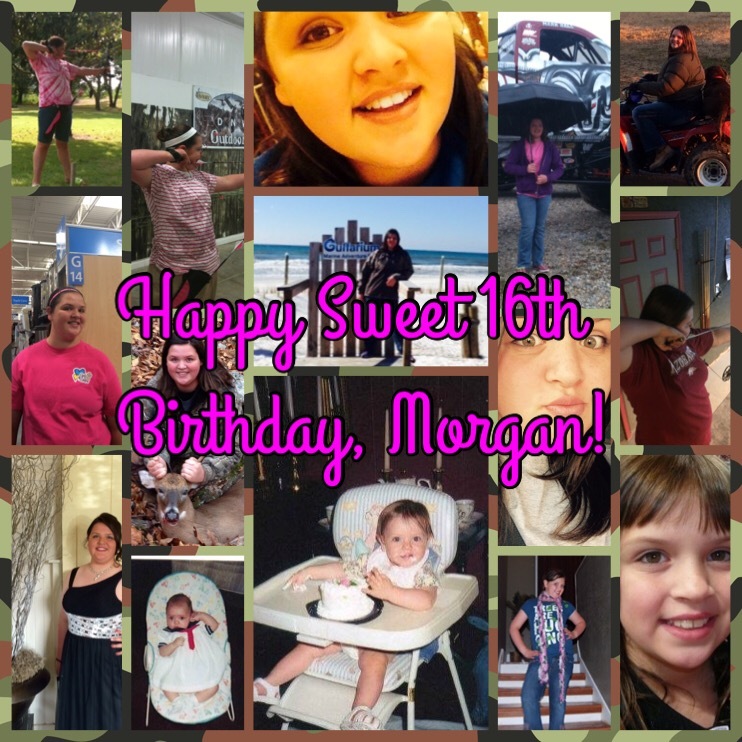 On Tuesday, June 29th, 1999, at 4:03 pm, our daughter Morgan was born via emergency c-section. She weighed 8 lbs. 11 oz. and measured 21 1/2 inches long. Nearly a month early, you couldn’t tell by those measurements. We were so thankful to God she had no health issues at all. Every year on her birthday, we regale her with the story about the day she was born. Tommy has to fill in a lot of blanks for me due to my being partially sedated that afternoon. Ha! Ha! Sixteen years have passed. Sixteen! Oh, my goodness! I cannot believe she’s sixteen! Where has the time gone? She’s had a learners permit for over a year now and today she will have her drivers license. She’s been ready for this day for quite sometime now. Her daddy and I have not been so ready. With another year under her belt, comes new adventures and responsibilities. For her daddy and me, comes the part of letting her go and having some of those adventures, within reason, of course. Here’s to another year, dear daughter! One of many great times and adventures! Your daddy and I love you more than you know! For the past few days, we’ve been under a heat advisory. The temperatures have been in the 90’s and the heat index has been up to 110°. Thankfully, we have air conditioning in our water truck while we wait for my husband to reload the spray rig. We also keep a cooler full of water and sports drinks iced down. Our dog, George has been going to work with us, and enjoys sitting in the cool truck. He has his own food and water bowls in the extended cab part of the truck. When a pond is nearby, we let him out to take a dip. Here is George below in a video swimming in a pond recently. Stay cool my friends. If you have to be out in this horrific heat, stay hydrated. Check up on your elderly family and friends as well as your furry friends.